I’ve researched several ways to make college more affordable, including going to community college, using tax credits, and using CLEP exams. I’ve generally discounted the idea of getting a Pell grant, because this government program that gives up to $5,815 per year to students is geared towards low income families. Upon further investigation, I have learned how Pell grants are calculated and now believe that my kids will be eligible for large Pell grants every year they are in school. If you think you can’t qualify, look at the formula and check again. Pell grants are Federal money to assist with college costs that does not have to be repaid. In the 2015 – 2016 school year total expenditures were $28.2 Billion and a total of 7.6 Million students received Pell grants. Students can qualify for 6 full years of Pell grants. Based on this years Pell grant size, this amounts to a total of $34,890 in all. If you have several kids, this adds up to an extremely large amount of money. Pell grants can be used for tuition and fees, room and board, and books. The Pell grant application goes into extreme detail on both student and parent income and assets. They then use a formula based on these amounts to determine what the expected family contribution should be. The formula then looks at the projected college costs for the student and makes a determination on how much of a Pell grant will be issued. A Copy of the FAFSA worksheets is available here. Many parental assets are not included in the assets calculation for Pell grants. Exemptions include: Primary residence home equity, retirement accounts, and $40,000. All assets beyond these amounts are counted as assets available to go towards college expenses. 12% of these assets are part of the expected family contribution. Parental Income is figured out by taking the parents Adjusted Gross Income, adding in non taxes benefits such as disability benefits. (NOTE: foster care payments, earned income credit, child tax credit, welfare payments, untaxed social security income, military housing and combat pay are not to be counted.) and subtracting several credits. Social Security, State and local income tax, and Federal income tax are backed out, and there is an Income protection allowance based on family size. There is also an employment expense allowance for single parent households and households with 2 working parents. After all of these allowances are subtracted from the parents income, we arrive at the available income for college expenses. This income is applied at a graduated rate, so the higher the income level, the higher the percentage that counts as a parental contribution from income. 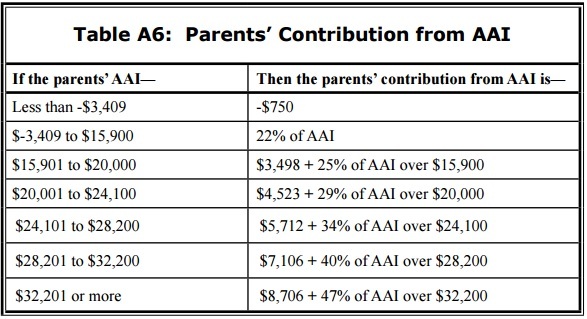 If the parents AGI is under $50,000, then their assets are not taken into consideration. This is HUGE for early retirement folks. Keep in mind that AGI is after 401K, HSA, and IRA contributions. If you make $80,000 a year and contribute $30,001 to tax deferred accounts, then you would qualify for the simplified means test. This does not mean that having an AGI of under $50K will qualify your kid for the maximum Pell grant, but it does get you a lot closer, especially if you have substantial assets outside of your primary residence and retirement accounts. If the parents AGI is under $25,000 then they have an automatic family contribution of $0, which would qualify the student for the maximum Pell grant. For this example, we have a family that is able to hit an AGI of under $50,000. Now that assets are being completely ignored by the Department of Education, we need to look at how variations in income affect Pell grant size. A bit of planning here can make a big difference. This leaves us with an income of $43,782. This allowance is kind of baffling. For a household with 2 working parents, either 35% of the lowest earned income or $4,000 is exempt, whichever is less. For a household with 1 parent and that parent works, there is the same exemption. For a household with 1 parent that does not work, this exemption is $0. In this scenario let’s assume 1 parent stays at home, so we will not receive an exemption. Now that the taxes have been backed out there is an income protection allowance based on family size. 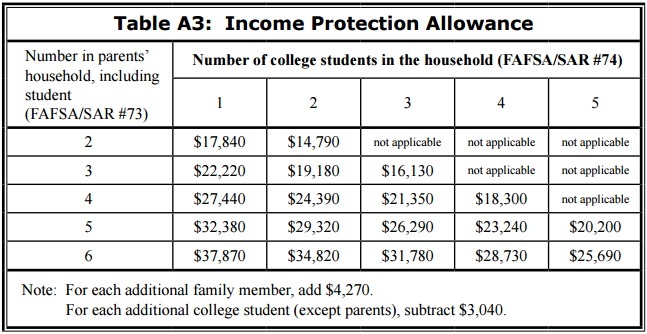 For my family, which has 6 people in it, the total income protection allowance would be $37,870. This leaves $5,912 from income available for the family contribution. 22% of this counts as the family contribution, which would be $1,300, not including any expected student contribution. This reduces the Pell grant by $1,300. The percentage of income that counts as the family contribution is on a sliding scale that increase with income up to 47%. Assuming we have a bit of flexibility, now that we know the formula we can make a few small changes in order to get the expected family contribution to $0. 1. Make less money! By making $5,912 less, then there will be no liability. If we earned $43,000 instead of $49,000 we would have $0 liability. Living off of $43,000 for a family of 6 may SEEM difficult, but it is really easy if the house is paid off and retirement accounts are fully funded. Also, a family with 3 or more kids earning $43,000 per year would qualify for $2,155 in Earned Income Credit and $4,000 in child tax credits. 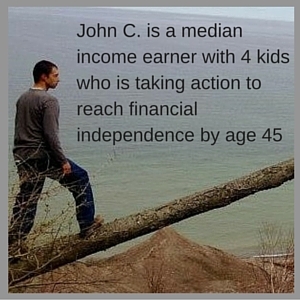 All of these factors combined make living off of $43,000 really like an income of $70,000. 2. Have the second spouse work and earn around $12,000, while the primary earner works less. This would allow the AGI to stay the same, but would allow the family to receive the $4,000 employment expense allowance. This would reduce the available income from $5,912 to $1,912, which would reduce the expected family contribution to $420. Student assets are assessed at 20% rather than the 12% like parents assets are for expected contributions. If the parents qualify for the simplified means test, then the student also qualifies, meaning that assets are ignored. Because of this we only need to look at income to figure out how much the student is expected to pay. Combining this with the expected parent contribution situation that we outlined above, the total expected contribution from the family would be $1,742, without taking any action to reduce the contributions. This would result in a Pell Grant of up to $4,073. Once again, knowing the rules can help out quite a bit with lowering the expected contribution. Lowering total income from $10,000 to $8,000 would completely eliminate the expected contribution. That extra $2,000 is effectively reduced by 70%. 50% for expected family contribution, 10% for federal income taxes, 7.65% for social security taxes, and 3% for state income taxes. What If I Don’t Qualify For The Simplified Means Test? If you don’t qualify for the simplified means test then assets are taken into consideration. Remember that primary residence home equity, retirement accounts, and $40,000 is exempt from parental assets. Beyond this, the expected contribution from assets is 12% of total assets. This means that even if the expected contribution from income is $0, it will only take a total of $88,458 in assets outside of principal residence home equity and retirement accounts to completely wipe out any chance at a Pell Grant. I figured this out by dividing the maximum Pell grant amount by 12%. This is a situation where having a substantial emergency fund and a rental house may work against you. If you have multiple kids, then it certainly may make sense to start making some adjustments a few years in advance to reduce your assets outside of retirement accounts. Bob and Sue own a home with no debt and they own a rental house that has $60,000 in equity in it. They also have a cash emergency fund of $30,000. They earn $90,000 a year and contribute 25% of their income to their retirement accounts. They have 4 children and the oldest will begin college in 2 years. It isn’t reasonably achievable for them to reduce their income enough to qualify for the simplified means test. Transfer money from the rental house into retirement accounts. Bob and Sue both work, and have an HSA account. Since their modified AGI is less than $98,000 they can also contribute to deductible IRAs. Step 1: Take out a new mortgage on the rental property, keeping only 20% equity in it. Assuming the home is worth $100,000 This means they are reducing home equity from $60,000 to $20,000. They will use this money to live off of and increase their retirement contributions for the year. They can contribute a total of $53,750 per year to tax deferred accounts ($18,000 each for 2 401Ks, $5,500 each for 2 IRAs, and $6,750 for an HSA). If they were already contributing 25% of their income to retirement accounts, this would allow them to add $31,250 to these accounts for the year. In year 1 they are able to reduce their equity outside of tax advantaged accounts from $90,000 to $58,750. This doesn’t get them out of the woods yet, because they would still have to pay 12% of $18,750, which would be $2,250. But WAIT!, since they contributed so much money to their tax advantaged accounts, their AGI dropped from $67,500 to 36,250 for the year, allowing them to qualify for the simplified means test. With this reduction in income, they would qualify for a full Pell grant in year 1. Step 2: For year 2 they would transfer the remaining $8,750 from the mortgage on the rental property and $10,000 from their emergency fund into retirement accounts as well. This would give them an AGI of $48,750, once again allowing them to use the simplified means test. Now their total assets outside of retirement accounts have been reduced to $20,000 in equity on a rental property and $20,000 in cash. As equity slowly increases in the rental property the family can draw down their emergency fund slowly to account for this. At this level, for all subsequent years the family will have $0 in assets that would count towards the expected family contribution. Maintaining their income at $90,000 and their retirement contributions at 25%, their AGI would be $67,500. Any additional income that Bob and Sue can move into retirement savings would have a net benefit of 40% (22% Expected contribution, 15% Federal income tax, and 3% state income tax.) Now does it make sense for them to make all these moves in order to get a $2,600 college benefit per year? If it was for just 1 kid, probably not, but with 4 kids spanning most likely 16 total years in college, this $2,600 can add up to over $40,000. For $40,000 paying the extra interest on the $40,000 loan on the rental house and putting the extra money into their IRAs is well worth it. What if you don’t qualify for a Pell grant, or the Pell grant you do qualify for is so little it doesn’t put a major dent in your college costs? Believe it or not there are still other major advantages to filling out a FAFSA form and applying for a Pell grant, even when you are certain you won’t qualify. For starters, most promise zone scholarships require the student to fill out a FAFSA form. Promise zones were created in Michigan to provide free associates degrees to students who graduate from school districts in targeted economically challenged neighborhoods. Promise zone scholarships provide last dollar funding, meaning that they will pay for the costs for tuition and fees after Pell grant’s have been applied. In order to receive the promise zone benefit a student must apply for a Pell grant. This helps keep the costs of the program down, since the majority of students in the area will qualify for a Pell grant larger than the cost of attending a community college. Filling out the FAFSA form regardless of whether you end up qualifying for a Pell grant or not is also a requirement for many scholarships, some that don’t even take financial need into consideration. Filling out the FAFSA demonstrates that you are doing everything possible to pay for college. Pell Grants are only one part of planning for and paying for college. Just like with our tax code, the Pell grant system is something that you can learn the formula for and adapt in order to maximize your benefit. Have you gotten a Pell grant before? What was your experience like? 4 Responses to "How To Qualify For A Pell Grant"
I think the Pell grant is only for college level courses, so it wouldn’t cover getting your GED, but once you have your GED you should be able to get a Pell grant for college courses. what is the maximum income a family of 5 can have for 3 kids in college to receive the maximum Pell Grant? There are too many variables involved to give you one solid answer because they look at income and assets. I would recommend printing out the worksheets and doing a dry run through the numbers. For families with assets outside the primary home and retirement accounts the asset portion becomes a big deal and even owning 1 rental property with some equity in it can keep you from getting a Pell grant. The true sweet spot is under 50K of AGI, then assets don’t matter at all.